Best of albums always smell a bit like rip offs. And it smells even stronger if the band has “died” not so long ago. In this case I do have exactly this smell in my nose. 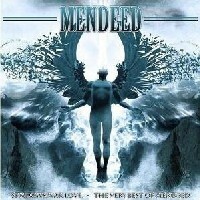 One the one hand, the track list is really excellent and gives a good overview of the work of Mendeed. But on the other hand, the playing time is really too short and the sound appears to be totally unedited. Why don`t they remix or at least remaster the stuff? In addition to that, there are no rarities, no live tracks on this album. All in all, this is one for those who haven’t heard of Mendeed so far. It`s a CD full of party compatible songs and you get a good impression of the work of the Scots. We can only hope that Mendeed will maybe change their minds one day and continue making music.